The AmeriGlide Pool Lift is a comfortable, easy-to-use solution for swimmers who have trouble getting in or out of a swimming pool. 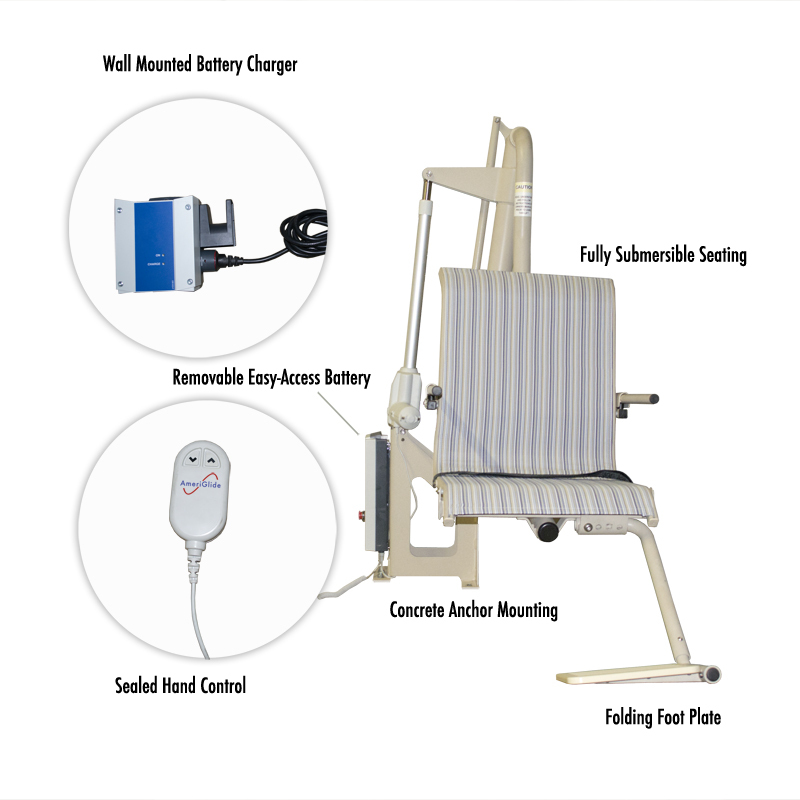 The sling seat is fully submersible and designed for comfort, with a foot plate and arm rests that offer support or can be folded out of the way. 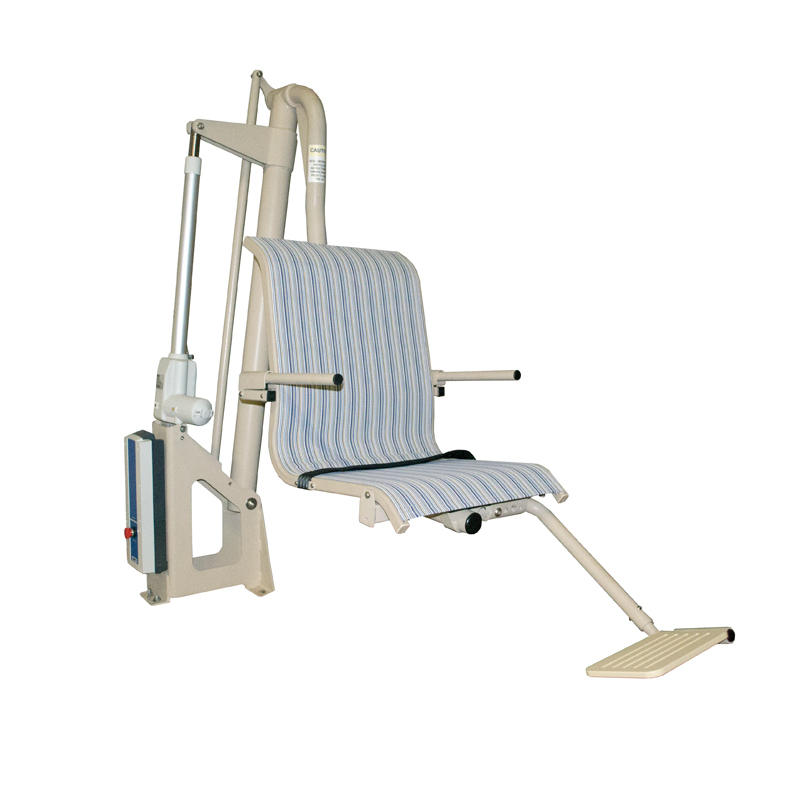 The sealed hand control is simple to operate so the person using the lift can control how low or high the seat goes. 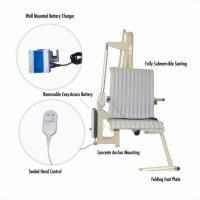 The AmeriGlide Pool Lift lowers to 26" and is ADA-compliant for the new regulations that go into effect in 2013. Four concrete anchors mount into the deck 4" deep for security, and the pool lift easy unbolts from your deck for seasonal storage. Special features include a hand controller and battery pack that are easily removed for storage inside until the lift is needed eliminating the problems associated with unauthorized use at pools without life guard staff. This lift is manufactured by lift experts to the same demanding quality standards that have made AmeriGlide the lift leader in the USA. Quality from top to bottom in design, operation, and construction to provide years of low maintenance service. Our stainless steel anchors are included in the price. Our battery is included in the price. Our hand controller is included in the price. 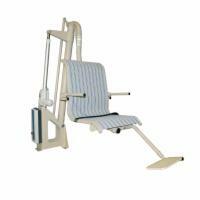 The AmeriGlide Pool Lift is the best valued ADA compliant lift on the market. Shop around and see for yourself. For more information on ADA compliancy, please review the ADA information below. The ADA Frequently Asked Questions section is a must read or call our knowledgeable staff for help or information.